Hot tub plumbing is made up of pipes, hoses and connectors to route water from the spa pump to the jets and back. The circular path begins at the suction intakes located in the footwell of the spa. 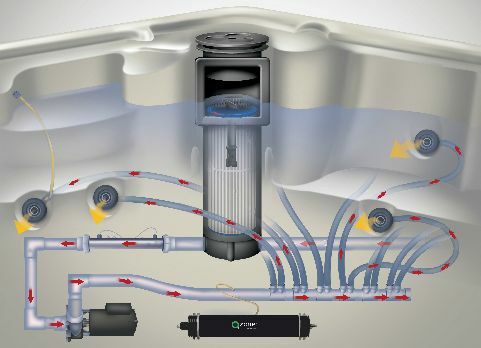 As the pump is in operation, suction is created at the front end of the pump which is connected to the suction intakes, protected by a screen or made up of little holes to avoid getting any larger objects into the hot tub plumbing. The pump motor spins an internal shaft that turns the impeller, a little wheel inside the pump that moves the water. The discharge side of the pump then expels the water and projects it towards the jets, usually via manifolds which are plumbing parts that have a large input and several smaller outputs so the water pressure is evenly distributed to all of the jets. Plumbing in hot tubs is usually held together with glue joints. 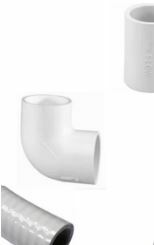 There are also clips that may hold together lighter hoses, but robust PVC glue is an industry standard. Usually the blue glue is used which instantly bonds pvc together in a matter of seconds. In this video is an introduction to the hot tub parts you may need for hot tub plumbing repairs. In case a hot tub leak is detected, owners of those spas without the entire cavitiy filled with spray foam, will have an easier time spotting and fixing any leak. The actual plumbing parts needed for a leak repair usually only cost a few dollars. The expense in a hot tub leak repair is finding the leak, having parts on hand to fix the leak along with a good, fast-drying PVC glue, and mainly doing the work of cutting out any old or broken pieces and gluing in new, replacement plumbing parts. A hot tub spa tip for gluing PVC connections is to apply the glue with the provided dabber in a circular motion around the glue joint several times rapidly to build up heat. It is the heating up of the PVC connection that helps create a solid bond. Usually applying the glue in a fairly rapid circular motion for at least 10 times around will provide ample coverage and warm up the joint. Then simply plug together with a slight twist and hold still for several seconds as the repaired joint sets. You may want to hold it for about 30 seconds or so to assure a good bond. Some like to use a PVC cleaner or primer first on the joint to be glued, but that is often not necessary if the glue is applied properly. The connections should be clean and free of any dirt. Tools to have on hand may include hose cutters or a hack saw to cut open pieces of hose and pipe, sand paper or other smoothing item to eliminate frayed edges at the cut, pvc hot tub glue, hot tub plumbing parts and of course access to the leak. Prevent leaks by maintaining hot tub water and avoiding any remaining water when leaving a hot tub outdoors in the winter as that can lead to manifold and plumbing cracks to deal with in the spring. Hopefully, you will never need a plumbing repair in your hot tub, but if you do, get discount spa plumbing repair parts online here.